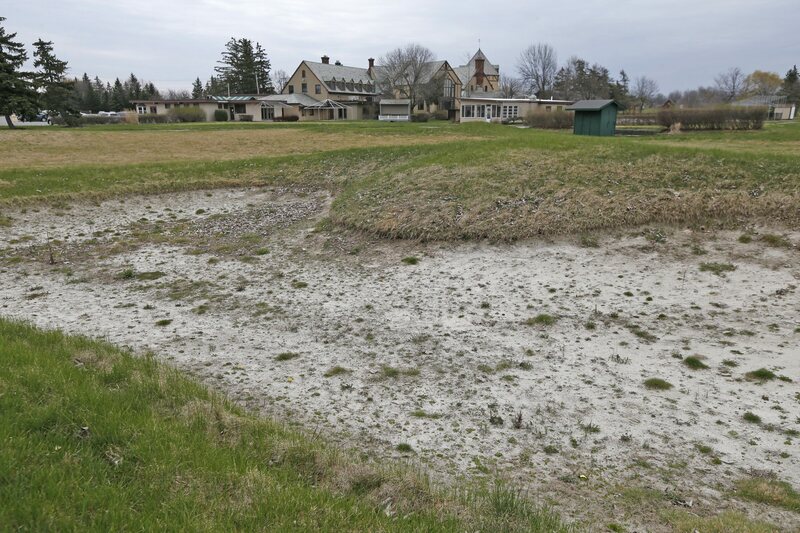 The developer of the former Westwood Country Club has added townhouses, shifted a senior housing complex to the interior part of the site and removed an office building altogether in the latest version of its controversial plan to reuse the former golf course in Amherst. 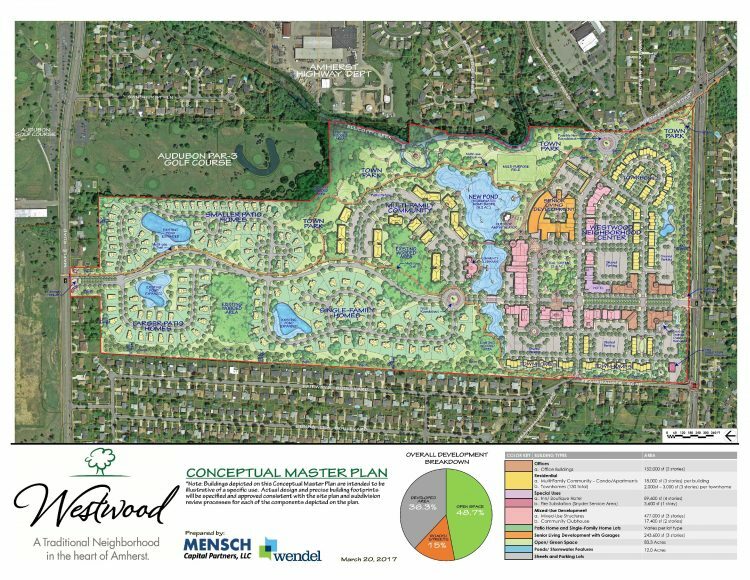 This is the fourth version of the project that Mensch Capital Partners has filed with the town, and as with previous changes to the original plan, the latest proposal tilts the overall mix of the development further toward housing and creates slightly more green space at the site. Still, it remains unclear whether the developer has done enough to address the bitter opposition of many homeowners who live along Sheridan Drive, North Forest Road and Frankhauser Road, nor whether Mensch has provided a sufficient response to traffic-safety, sewer, market-demand and environmental-cleanup issues raised by the project. "All of this is about listening to our neighbors," said Andrew J. Shaevel, who leads the group of investors behind Mensch Capital. Mensch Capital has proposed a $250 million, mixed-use redevelopment of the sprawling, 171-acre site in Amherst. The group, which bought Westwood in 2012, proposes transforming the property into housing for 1,700 people, retail and commercial space and park land. Mensch Capital Partners has filed a new version of its redevelopment plans for the former Westwood Country Club site that adds townhouses, shifts senior housing and eliminates an office building. The project requires rezoning much of the property. The Planning Board must make a recommendation on the project application, but the Town Board has the final say on the rezoning request. The investment group has held a number of meetings with residents since unveiling its plans in 2014 for a mix of single family homes, townhomes, patio homes, senior housing, a hotel, office buildings, retail space and parkland and open space on the property. "Over time, what's happened is the project has become, No. 1, more and more residential and, No. 2, more and more permanent open space," said Sean W. Hopkins, an attorney who represents the developer. Senior housing that previously was located at the corner of Sheridan Drive and North Forest Road is shifted northwest from that corner more to the interior of the site, where it now would sit on one side of the project's focal green. This, Shaevel said, would allow seniors to walk around the green and to retail establishments lining the green. The senior complex remains the same square footage, but it will have a smaller footprint because it will be three stories tall instead of two stories tall. The senior housing takes the place of a 112,800-square-foot office and community building that originally was planned for the east side of the focal green. That leaves the project with four, two-story office buildings containing a total of 152,000 square feet of space. In place of the senior complex at the corner of North Forest and Sheridan, Mensch instead would build 75 three-story townhomes. The corner also would feature extra green space. Neighbors, Shaevel said, "would rather see residential as a buffer along Sheridan Drive." At the west edge of the site, Mensch has added 15 townhomes to the planned parking lot to make that side of the development more attractive to residents along Frankhauser Road. In all, the number of townhomes included in the project rises from 40 in the December version of the project to 130 now. The amount of permanent open space was increased from 81.6 acres, or 47 percent of the total site, to 83.3 acres, or 49 percent of the site. Shaevel and Hopkins said they hope to get on the agenda for the April Planning Board meeting. Mensch submitted a prior version of the plan in December and the Planning Board held a public hearing on that version in January. Seventeen speakers addressed the board for 50 minutes, 15 speaking against the project and two in favor. The board adjourned the hearing until its March meeting, and at its March meeting adjourned the developer's application with no set return date.